Robe of white muslin. The Gallery of Fashion. Neoclassical fashion. Home » Robe of white muslin. The Gallery of Fashion. Neoclassical fashion. Robe of white muslin, Bandeau of white satin. The hair in light curls and ringlets. Bandeau of white satin, tigré in carmelite. White satin chiffonet mixed with the hair; three white ostrich feathers placed in the front, white satin petticoat. Robe of white muslin, embroidered at the bottom with silver, trimmed round the neck and down the sides with a silver fringe; long sleeves plaited and trimmed with lace, the upper part full, and tied with three silver cords. Round the waist a silver cord with two large tassels, tied at the left side into a bow. Diamond ear-rings. Plaited tucker, and a string of pearls round the neck. White gloves. White satin shoes. 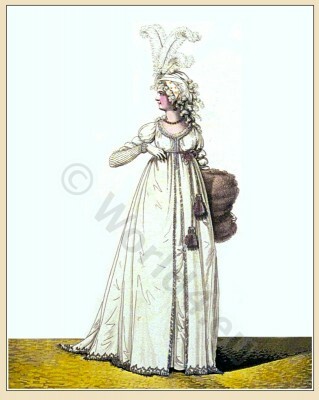 This entry was posted in 1795, 18th Century, England, Gallery of Fashion, Georgian period, Regency period and tagged England Georgian Era Fashion, Neoclassical dresses, Nikolaus von Heideloff, Regency period on 2/22/13 by world4.